Facebook has launched a new feature today for photo tagging that is sure to make brands and celebs happy. Now, you can tag photos with a brand, product, company or person’s Facebook page, similar to the way you tag your friends in photos. Facebook says that a Page can be tagged anywhere that someone can view a photo in the photo viewer. These photos will appear on the Photos tab on the Page, and not on the Wall and a Page can be tagged by anyone on Facebook, not just people who have Liked a Page. For now, the feature is restricted to pages that fall into the People and Brands and product categories. Considering the massive scale of photos on the social network, the feature is an opportunity for brands, in particular, to attach their name to photos where their products or name make a presence (though Pages cannot tag a photo; the photo can only be tagged by the uploader or friends). 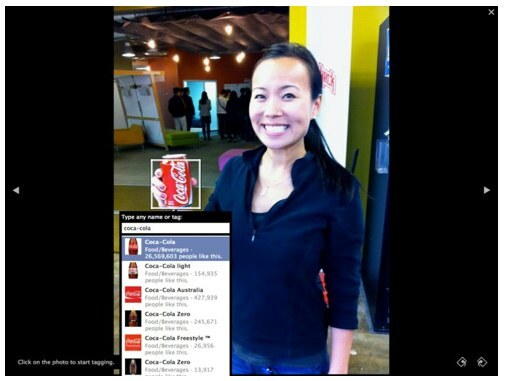 As shown in the Facebook post, a picture with a person sipping out of a Diet Coke can could be tagged by Coca Cola. Not only is this a way for brands to take additional ownership over their presence on the network, but it is also a form of advertising in some cases (where the depiction of the brand or person isn’t negative).